"Let me draw out for you what it means to shine some light into the dark box of illusions. 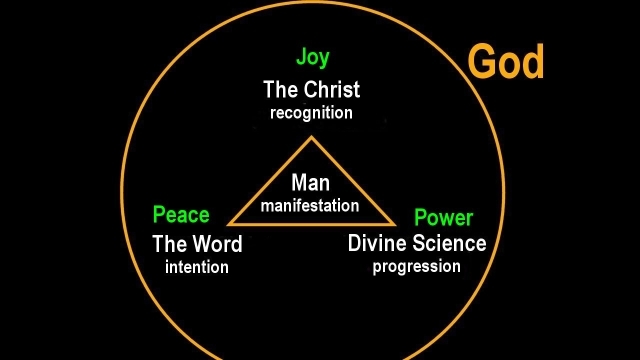 Let me illustrate what I perceive as the real Trinity," Jesus might continue. 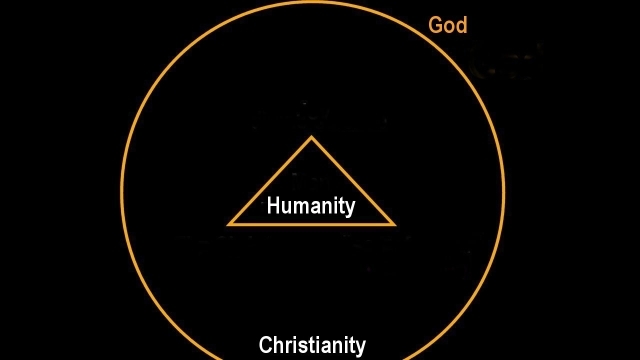 "The real Trinity begins with God as being All. At the center of this universal All, I see humanity located. Humanity needs to be there. It is the pinnacle of life with a near infinite range of creativity. "This divinely centered humanity unfolds at the very core of the great One that is God, which renders God and Man as One in being. The two is One whole, in the sense the Principle and its Idea is one. 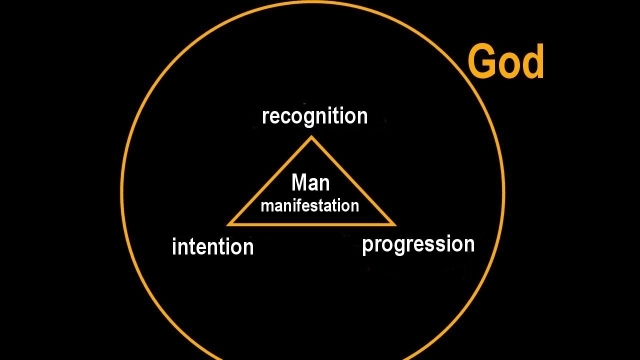 This unique geometry renders humanity as the Sons of God, in the sense in which a calendar month is sometimes referred to as the 'son' of a year. "I drew a circle around the whole, not as a circumference, but to locate the center. In reality there is no being outside possible, because the One is All. Nor is the concept of a center, actually possible either, in the larger context. "The concept of a center in the universal All, expands into a lateral lattice without boundary, with every individual part of the One existing laterally, side by side, like the tiles of a kitchen floor.So, Mary, see yourself as one of the tiles, and see yourself as bound to every other by strands of many colors, which are the spiritual colors of our common humanity, such as love, truth, life, soul, mind, principle, and spirit. And so, the strands of color that illumine the lattice and link it into one, are also the colors of God, so to speak. This tells me that every human being has a mind that can behold the truth, so that the phenomenon of a physicist not believing in physics anymore, is not possible in principle. Nor is it possible for you, Mary, not to experience Peace, Joy, and Power. "While you cannot measure these spiritual 'colors. and weigh them, it is plain to see that they are immensely substantial, because if even a single one of these 'colors' was missing, civilization would collapse, or would not exist in the first place. So, they do exist. "The basic Trinity that defines the nature of the universal All, is recognized in my sense of science, as the unity of God, Man, and Light. 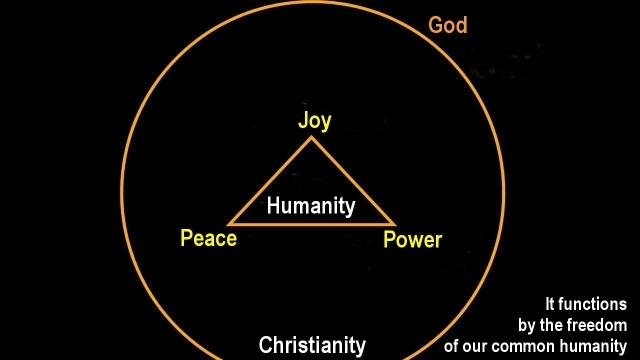 This Trinity is 'holy', in the sense that it is perfect. 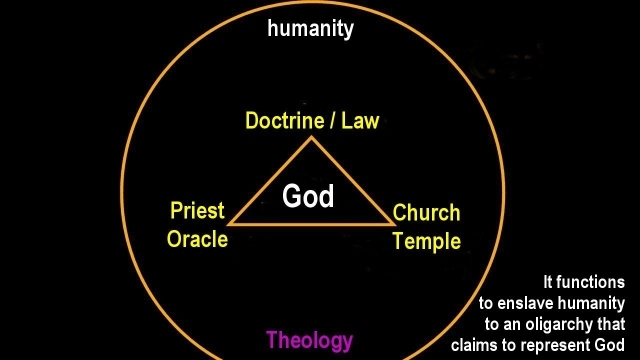 "In the nature of this basic Trinity, I can recognize secondary trinities existing, dynamically operating. Nothing happens randomly in the Universe. When Principle rules, there is an intention standing behind it. In the larger context the intention is, for the universe to be. "For example, the physical force of gravity evidently exists by intention, because without it, the universe would not exist. For this reason, the force of gravity exists. "Good, is an intention, likewise. Of course, good does not exist in isolation. Good come to light in intelligent recognition. The recognition is progressive. It progresses in science. 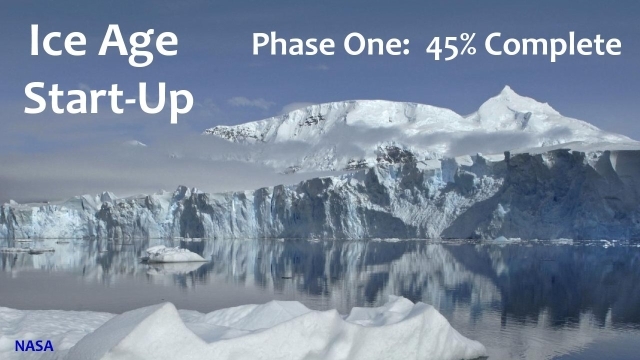 Science is expressed in progression. "Since this basic secondary trinity is spiritual in nature, we need to see it also in terms of specific spiritual concepts that we can work with to understand the 'colors' that unite us. 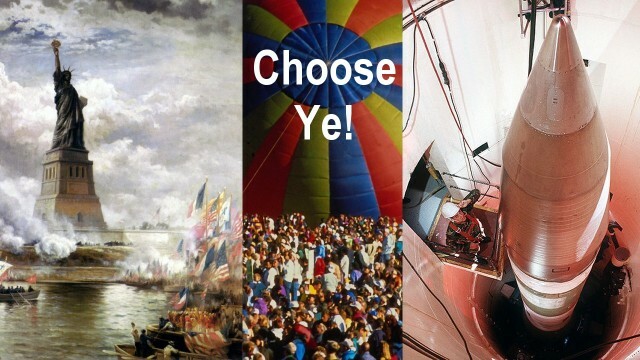 "Nor can this secondary trinity be without concrete manifestations. The secondary manifest brings us back to peace, joy, and power." 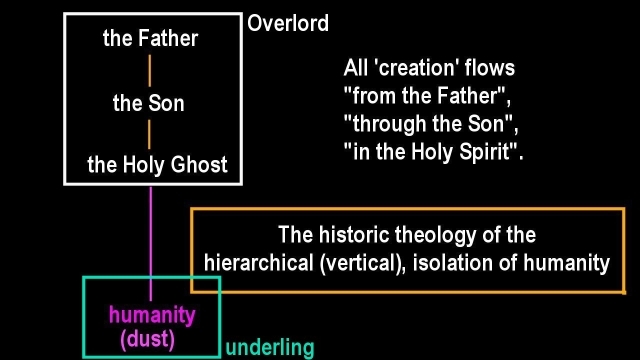 "You described the theological Trinity of the Father, the Son, and the Holy Ghost, as a vertical and thereby a hierarchical doctrine," Mary might say. "The doctrine places humanity at the bottom of the hierarchical heap and defines it as of no significance, a kind of underling. This is still happening to the present day? What hope does humanity have under this terrible doctrine of isolation, and near infinite degradation? I see no hope. The doctrine renders us powerless. 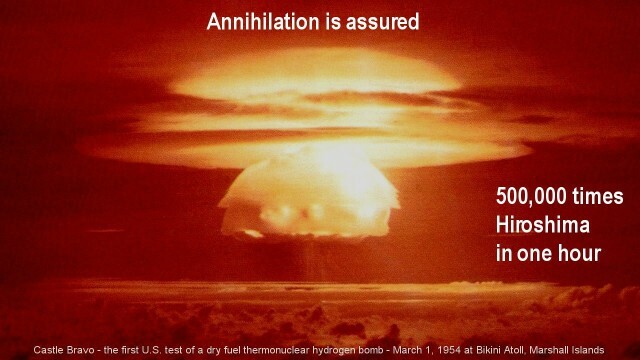 "I am not surprised that humanity has filled its powder kegs to the brim with nuclear war preparations, while it has blinded its eyes to the massive evidence before it that the next Ice Age transition will occur in 30 years, by which the entire planet will become uninhabitable for humanity, unless humanity builds itself the needed technological infrastructures for it? "For 70 years humanity has been evading the easy problem, and has been adding evermore to the powder keg for nuclear war. With it humanity assures its self-annihilation. I see this as the mark of a humanity that lives like slaves under an oligarchic system of overlords that dictates the thinking and actions of society. "I see the same in the blinding of society to the Ice Age Challenge. This is done with the intentional distortion of humanity's science. The masters of the oligarchic system are proud to have achieved this devastating control over society. They own its very soul. "It took them less than a century to achieve this near complete subjugation. But they have succeeded. They have established themselves as the empire of the world, not by force, but by quiet, gradual subjugation. Every single nation in the world is now living subjected to this control. "America, China, Russia, Germany, France, Israel, England, even little North Korea, all hail the terror weapon that has been built for no other purpose than the mass destruction of humanity, including their own destruction. None of these nations own themselves anymore. "Likewise, every single nation on the planet bows, with its face to the dust, before the perversion of science that hides the Ice Age dynamics. To date, not a single nation on the planet has broken itself free from the trap of the world empire, living as slaves to it. "I am not surprised at this, because this is precisely what the theological Trinity has projected for almost two millennia in various forms. This trap has rendered humanity as having no more significance than the dust of the ground, or as impotent slaves whose souls are deemed to be 'purified' by the suffering they are able to endure. 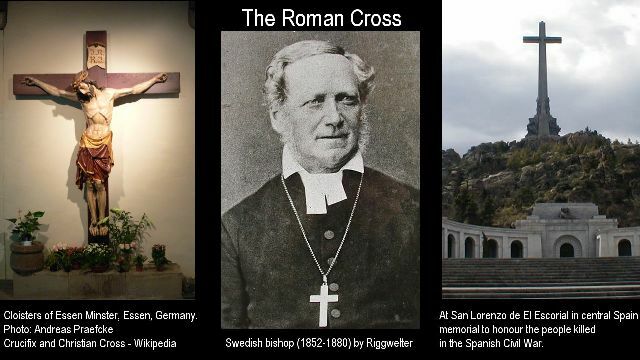 Humanity celebrates the Roman cross. It celebrates its impotence. 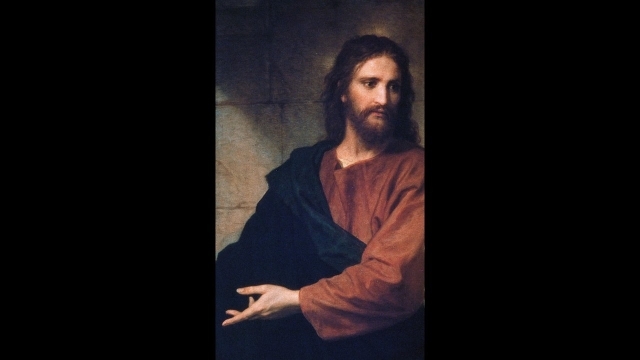 "Christianity has lived under the signet of suffering and impotence from the day in which 'Christianity' was 'invented', with the signet of empire imposed from the highest level of its theology. "The theology of oligarchy is, that if the very Son of God is ordained to suffer and die, then so is humanity. By its inherent impotence humanity is doomed to the same fate. 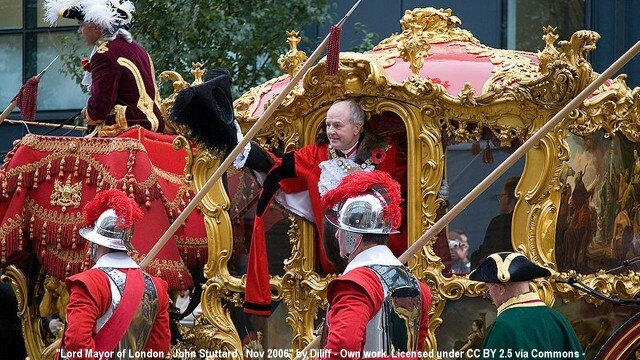 "Under this theology of oligarchy, it becomes a divine service for humanity to subject itself to a course to oblivion. 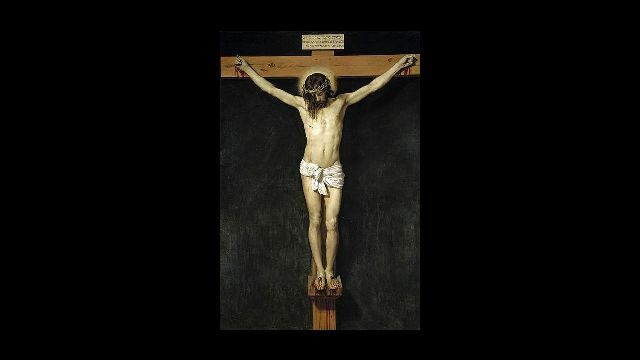 The theology of the political trinity states that the Son of God took upon himself all the suffering in the world. It states that he suffered for us, as an Exemplar. "What a trap! What a trip! That's despotic thought control in the extreme. How do we even begin to become free?" Mary might conclude. 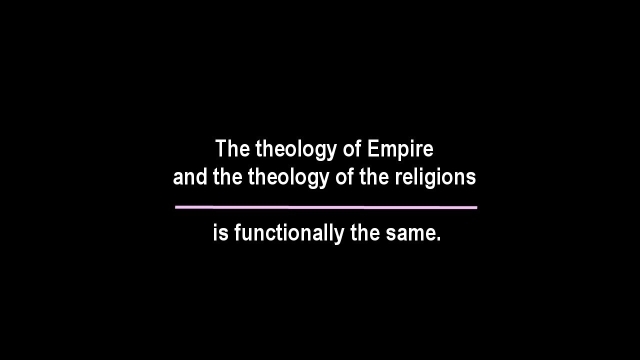 The theology of Empire and the theology of the religions is functionally the same. 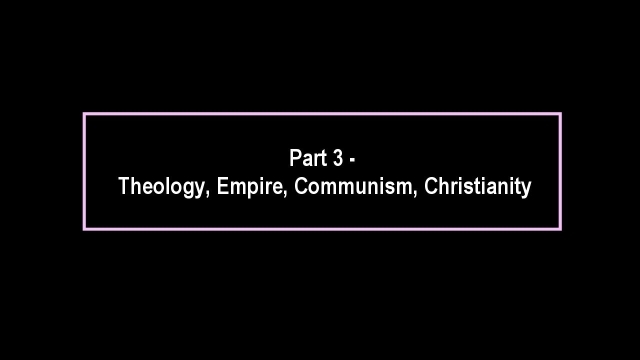 "This is so, because the vertical theology of Christianity, is a copy of the Roman model, and of every model of empire before it, including that of the religious empires, " the master of science might say. "The system of Empire was all that was known at the time, Mary. It was practiced by the priesthood in almost all religions. 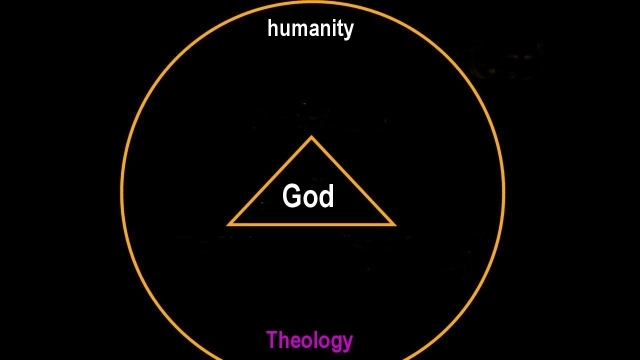 Every theology that existed had put some type of god at the center and humanity at the circumference, that is impelled to serve that imagined god. "The ruling empires used the same theology, and still do. In their case, the oligarchy has placed itself at the center, and society is impelled to serve IT. "In later time, the masters of Empire laid an egg, and invented Communism. 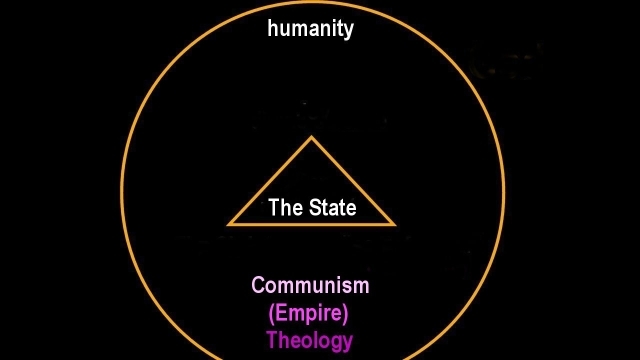 In Communism, the State is God, and is placed at the center. In this case society is impelled to serve the State. "My model is radically different. Divine Science places 'humanity' at the center, at the very center of the heart of the universal One that is God. This is the only model that is fundamentally different. "In the case of the theological model three structures have been applied that assure that society serves its God. 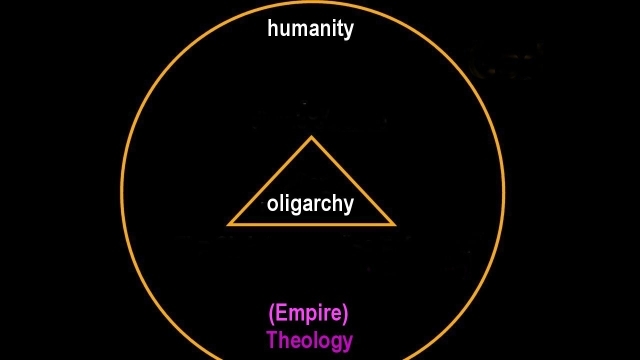 The model functions toenslave humanity to an oligarchy that claims to represent God. "In the case of the Empire Model, the oligarchy established itself civil and legal structures, and also illegal structures to assure that society serves it. 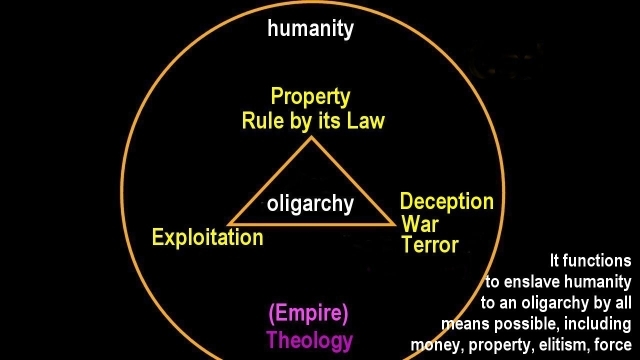 This model functions to enslave humanity to an oligarchy by all means possible, including the means of money, property, elitism, and if need be, force. 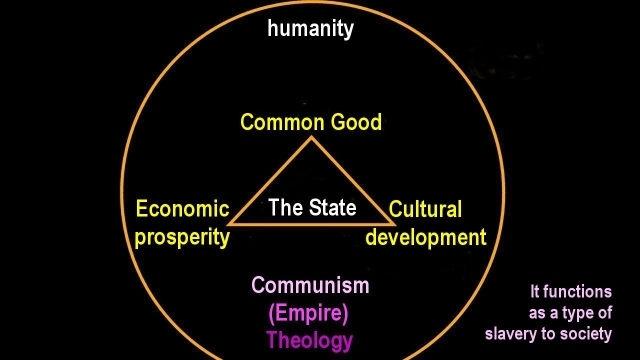 "The model for Communism employs more noble structures, to assure that humanity will serve its god, which in this case is the state. But this system cannot work either, in a productive manner, because humanity is an auxiliary to it, instead of being the center. No matter how noble the goals may be, when 'principle' is wrong, nothing productive results. This system is a paradox in essence, because it impels society into slavery to itself. "Only the scientifically correct model serves humanity. It is powered by the freedom of our common humanity. It functions. It is the only system that functions productively. All the other systems are inherently counter-civilizational by design. Some more so than others. The boundaries between the models blur. 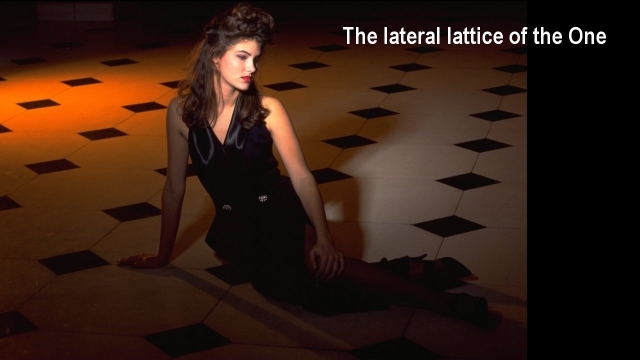 Most of the models that rule today in various parts of the world, are mixtures of all four models, especially in terms of the applied supporting structures. "Some version, of course, are outright dangerous, even immensely consequential, when dangerous structures are implemented. "The most dangerous system, of course, is the system of Empire and the structures that this system became known for. "One of the dangerous supporting structures of the system of Empire, is Deception, War, and Terror. These dangerous structures are located where in my model, 'science,' is located. The imperial weapon of Deception becomes most dangerous when the target is science; when the objective is to turn science upside down, or to disable it. "Here is where the Congress for Cultural Freedom comes into play that was set up to degrade culture, which simply means, freedom from culture, or in the case of science that is one of the pinnacles of human culture, the degradation means freedom from science. Under this umbrella, it becomes possible to create an environment in which physicists can be 'inspired' not to believe in physics anymore. This engineered failure in society has become epidemic in modern time, so much so that the very existence of humanity is now endangered by this epidemic that has deception implanted at its root."